India is the world's second largest producer of fruits and vegetables, but also accounts for one of the biggest food loss and waste with harvest and post-harvest losses in fruits, vegetables, and grains worth INR 440 billion every year1. One of the major reasons for this food waste and food loss is the lack of an efficient cold chain infrastructure from the farm to the fork which includes refrigerated transport, pack houses, collection centers, and cold storages. One other reason for wastage is inadequate knowledge on how to handle the perishables and the skill levels required to take care of these at various stages. Physical loss of food has a multiplier effect in associated waste of inputs like water, electricity and fertilizers. It also adds to greenhouse emissions, contributing to climate change. Farmers' profit margins dwindle with increasing perishability of their produce. 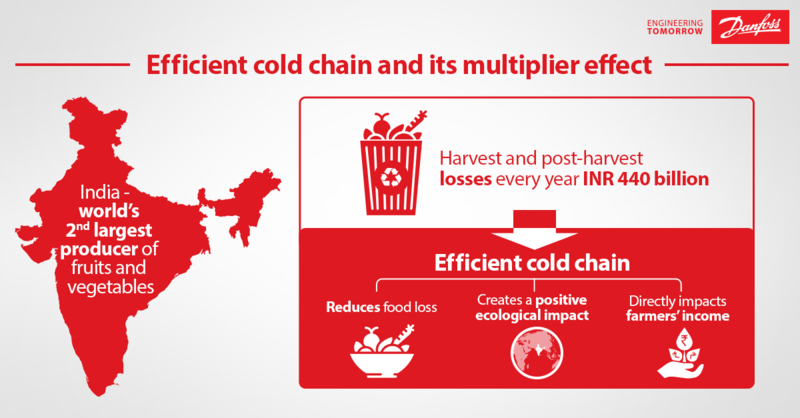 A well-defined cold chain infrastructure could well reduce food loss, create a positive ecological impact, and have a direct effect on farmers' incomes. India has around 6,300 cold storage facilities across the country, with an installed capacity of 30.11 million metric tonne, 75-80% of which is suitable for storing only potatoes, which contributes to only 20% of the agricultural revenue3. 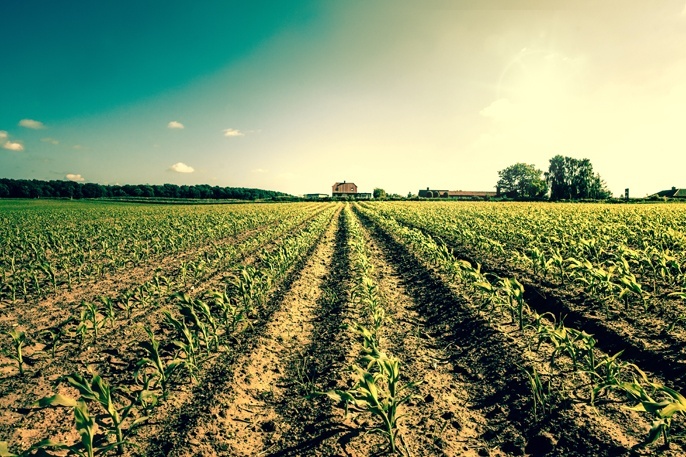 Adopting proven technology solutions for an efficient cold storage infrastructure will help achieve the goals of improving overall agricultural output and revenues. Let's have a look at some emerging solutions2. A range of commodities such as fruit, vegetables, dry fruits, spices, pulses and milk can be stored at multi-purpose cold storage facilities throughout the year. With separate chambers operating at various temperatures and simultaneously maintained, these facilities save costs and space and deliver higher profitability. Even though multi-purpose cold storages command a miniscule percentage in India presently as compared to the single commodity storages, this number is slowly improving due to rapid urbanization, growth of organized retail and spurt in food processing business. The freshness and shelf life of highly perishable items such as fruits can be increased by storing them in controlled atmosphere, a method that regulates the temperature along with the concentration levels of oxygen, carbon dioxide, ethylene and nitrogen to maintain a specific atmosphere for that particular product or fruit. This process delays softening, quality change, yellowing etc. Grains, legumes and other dry commodities are also stored in a controlled atmosphere to control insect pests. Natural ripening of fruits like mangoes, bananas and papayas is often slow, uneven and leads to desiccation and high fruit weight loss. A ripening chamber releases ethylene gas to naturally ripen the fruits and this doesn't destroy the nutrients of the fruits. Using a ripening chamber helps maintain precise conditions specific to the product's requirement, and helps uniform ripening resulting in a firmer pulp texture and a better flavour. What's even more helpful is that farmers can choose to pause or hasten the ripening process based on market demand, resulting in less food wastage and higher price realization. Different products require different temperatures and humidity level maintenance. In conventional cold storages, the temperature adjustment and storage method depends upon the experience of the operator. Negligence and inaccuracy due to human intervention can result in product spoilage. The use of electronic management systems and controllers assist by controlling the storage environment automatically, with the preset values which help in precise control, food safety and compliance. A great example of state-of-the-art cold storage where customers can store food items even at varying loads and ensure high-quality food safety and minimal food loss from farm to consumer is Roshan Frozen & Cold Storage, located at Sonipat in Haryana, India. This cold storage provides frozen storage of fresh and processed foods and caters to the Delhi-NCR and northern India. Built using Danfoss technologies, it is the first cold storage in India built to European standards. With a capacity of 5,000 MT, the model cold storage offers pallet-based storage and is compliant with Food Safety and Standards Authority of India (FSSAI) norms. The multi-commodity cold storage is designed to operate at -25°C to +10°C throughout the year, and utilizes Danfoss variable frequency drives (VFD), valve stations, and system controller for monitoring and defrost control. Apart from superior food quality, the model cold room is also the most cost-effective and energy efficient solution in the Indian market, reducing operational expenditure by saving 15–20 percent in energy costs vis-à-vis a conventional cold store. An efficient cold chain mechanism counters the perishable nature of food, to extend its saleable life cycle. It applies technology to stretch the marketable time of a perishable product, for a longer duration. A cold chain network can be used to link production centers to the consumption centers through cold chain grids. These can connect key production areas with centralized distribution channels that ensure last mile delivery of the produce in the desired quality and quantity. By knowing the markets and timing the harvest, the producers can meet the demand and have a higher share of wallet with reduced loss4. Farmers and owners of the produce can reach newer markets to realize greater economic value. This boosts their incomes and incentivizes higher agricultural production – a win-win situation for farmers as well as consumers!